Eugene Spearman, radio operator with the 384th Bomb Group, shares another of his great stories. He starts with an explanation of how this one came about. The morning of February 15, 1945, started early for me when the sergeant shook the small bunk I was sleeping in and said, “Wake up, Spearman. You are flying today in Nicolai’s crew in B-17, No. 242. Be down at briefing at 4:45.” I, along with several other sleepy crewmen, struggled out of bed and hurriedly pulled on clothes. The place was Grafton Underwood, near Kettering, England, in the Midlands, home of the 544th bomb squadron, 384th bomb group, 2nd wing, 8th Air Force. Outside the small Quonset hut, I picked up the little English bike and pedaled down toward the mess hall, or chow hall. I had often wondered before on similar trips to the “Tomaine Tavern” (as the chow hall was known) just how many flight crewmen had owned the little bike I was riding. It was never necessary to buy a bike, nor did we have to wait any time after reaching the base before acquiring one. All we had to do was go down to the flight line and pick up one that Bill, or Pete, or Joe rode down yesterday or the day before, but did not get back across the Channel to make the return trip to the Quonset huts. After chow I rode on down to the flight line and entered the briefing room. Our briefing was conducted by several operational officers. First, the group commander told us the target for the day. If it was a well-known place like Berlin, Hamburg, Schweinfurt, or Leipzig, a low “Ah-h-h” mingled with a few moans usually echoed around the room. Today, it is Dresden. After giving us a description of the target, the type of target, and other pertinent data, he listed the first and second alternate targets. The intelligence officer then took charge and pointed out the probable locations of flak, and fighter concentration we would encounter. The weather officer told us the cloud conditions over the target, and the expected weather conditions at the base at our estimated time of arrival back to Grafton Underwood. A navigational officer pointed out our route in, the time of the “Bombs Away,” and the return route. With a wave of the hand and a “Good Luck, Boys,” we would rush in and put on the heated suits, wobble out to the small jeeps that carried us to the dispersed planes. I always thought everyone else looked like stuffed toad frogs in those suits. After reaching the planes, I noted that for this particular mission, our plane, #242, was christened “Stardust.” The fact that she had 29 small bombs painted on the fuselage did not impress me that she would make #30 roundtrip any easier. In fact, I shuddered to think what some German civilians would do to anyone who rode her down on German soil. Our cargo consisted of several magnesium incendiary bombs and six 30-pound demolition-type bombs. In a few minutes we had pulled into the line of traffic of about 40 B-17’s, awaiting our turn to pull on to the end of the runway. The roar of engines as they struggled to lift the heavy load of fuel and bombs was enough to awake all the residents of the Midlands. It was an impressive sight for this country boy. Standing just beside the end of the runway, where we made that final check of instruments before releasing the brakes, stood a minister. I don’t know what denomination he represented, but it was an inspiration to me to see him there. And then we were on our way. All whom I know who flew missions were superstitious. My superstition was a candy bar. At the briefing, they always gave us a candy bar – Milky Way or Snickers. I always placed the candy bar on the small table in front of me and ate it just before we touched down at home on the return. On this particular mission, the ball turret gunner came by my position and before I could stop him, ate my candy bar just after takeoff. To me, that was a major disaster. It was as if all my luck had run out. He resembled one of those ostriches with that candy bar going down his throat, and I would have shot him if we had not needed the belly gun to protect our plane underneath. It was a long flight in, with considerable flak, but few fighters sighted. A diversionary flight of B-24’s up the North Sea toward Hamburg had caused Herr Goering to use up much precious fuel to try to keep the submarine pens at Bremen and Hamburg from being attacked, while some one thousand B-17’s struck straight across Germany to Dresden. The Germans used two types of flak. One pattern type is when they just shoot the 88MM guns into the air over the area they wish to protect. Another is the tracking flak where they use their radar to stay on the target as it moves above them. Oddly enough, the pattern flak was most effective. At the end of the 20th century, when they vote on the man of the century, I will cast my vote not for Einstein, Anderson, or Von Braun – but the man who invented this: Chaff! On a radar scope, it looked just like a B-17, and it saved a lot of country boys from having to get out and walk at 30,000 feet altitude. It was a long flight back, but 11 hours after takeoff, we were back at the base. This mission was not one of the most important of the 8th Air Force, nor was it our worst. It was just one of many that broke the back of the German nation, and it convinced the German people as well as their leaders that they lost the war due to the strategic air power of the Allies. Eugene Spearman’s words mean so much to me. They help me understand what he and the other boys of the 384th Bomb Group, like my dad, experienced on a typical mission during WWII. 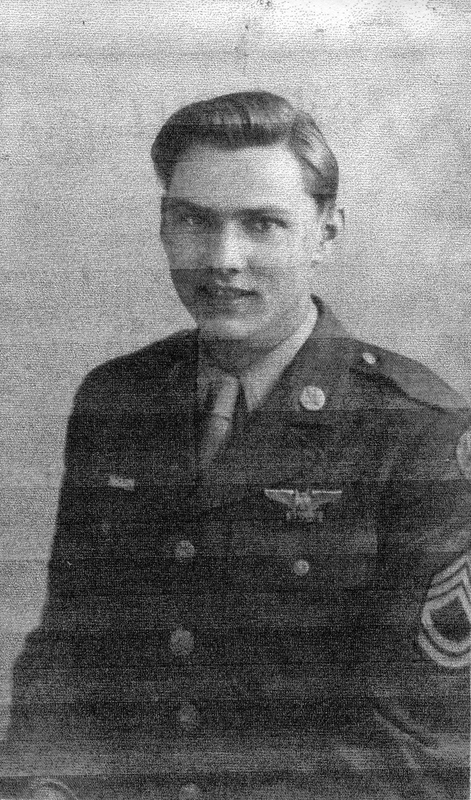 What Eugene doesn’t mention in his letter home is that February 15, 1945 was his very first mission. Heavy fog closed in quickly during takeoff operations, preventing almost half of the force from flying. The 384th Bombardment Group (H), initially ordered to provide all three squadrons of the 41st “B” group, formed itself into two reduced squadrons – lead and low – during assembly. They also picked up some aircraft from the 379th BG. The primary target was “visual only” so the secondary was attacked using radar aiming. Weather at the home base remained bad on their return, so all but one aircraft landed elsewhere. The secondary target attacked was the railroad marshalling yards in Dresden. The Nicolai crew, actually aboard aircraft 42-102459, aka “Little Kenny,” landed away at Seething Airfield, Station 146. By thearrowheadclub in 544th Bombardment Squadron (Heavy) on March 2, 2016 .